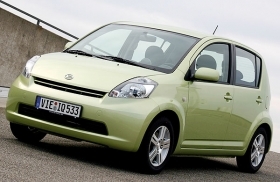 The new Subaru G3X Justy will be based on the Daihatsu Sirion (shown). LONDON -- Subaru could sell its new Justy in the UK after a six-year gap. The small-segment car goes on sale in other European markets starting in the autumn. Because the new G3X Justy will be based on the Daihatsu Sirion, a vehicle engineered for the right-hand-drive market of Japan, Subaru is considering selling it in the UK. Were looking at it, but no decisions have yet been made, said Subaru UK spokesman Arthur Fairley. The current G3X Justy is based on the Suzuki Ignis. Both are built in Suzukis, Esztergom, Hungary, factory. An earlier G3X Justy based on the Suzuki Swift was sold in the UK between 1995 and 2001. The production stop of the Suzuki-based G3X Justy has not been decided yet, Subaru spokesman Naoko Fujimaki said. Subaru has enough inventory of the G3X Justy for sales to continue through next spring, Fujimaki said. That means that the new G3X Justy, which will be imported from Japan, will be sold for several months alongside the current model. Subaru sold 5,311 units of the G3X Justy in Europe in 2006, down 13.9 percent from a year earlier. The full-year target for the new model is 5,000 units, said Fujimaki. The changeover from Suzuki to Daihatsu for the G3X Justy reflects the change from General Motors to Toyota as the largest investment partner for Subaru parent Fuji Heavy Industries. In 2005, Toyota bought an 8.7 percent share of Fuji Heavy from GM. The deal made Toyota the largest shareholder in Fuji Heavy. Toyota also controls Daihatsu, which specializes in building small cars.